SEASIDE, OR. – The Sunset Empire Park & Recreation District (SEPRD) announced this week it will be providing two complimentary beach accessible wheelchairs starting on July 7 for use by the public. These wheelchairs create new opportunities for those with mobility issues. 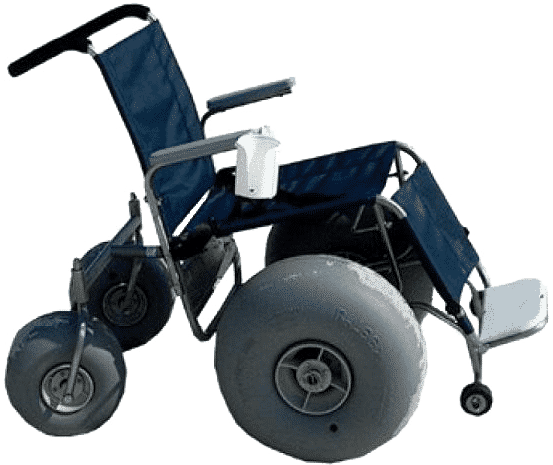 Outfitted with large, wide tires, the wheel chairs make it much easier for mobility impaired persons to go on the sand. Manzanita was the first community on the Oregon Coast to provide beach wheelchairs and Cannon Beach followed in their footsteps last year. Seaside joins the two in providing beach wheelchair access to the public. Randy Anderson, a local painter and advocate for disabled individuals, was one of the driving forces behind this program. Anderson has resided in Seaside since 1990 and wanted to provide beach accessible wheelchairs in this community for the thousands of residents and guests that visit each year. The program was also activated by Denise and Patrick Duhachek, owners of Wheel Fun Rentals in Seaside. Wheel Fun Rentals donated two beach wheelchairs from their inventory to the program with the hopes that SEPRD can provide year-round access. Additionally, Anderson will be providing an extra beach wheelchair to meet the demand that is anticipated. The program will kick off on July 7 and reservations, which are encouraged, can be made by calling the Bob Chisholm Community Center staff at 503-738-7393. Reservations are completely free and will be made on a first-come, first-served basis for a maximum of four hours.